Are you aware above the present situation of earth? how many organizations are formed here and abroad just to protect it from deteriorating? Well for me, I am not that confident to say yes, but I know some problems do really exist that needs much attention and I get inspired by the talks of some famous personalities like Leonardo Dicaprio and Al Gore to inform us and unite to save our planet. But recently, I am proud to have met the "Greenest Person on the Planet" Mr. Matthias Gelber a.k.a. The GREENMAN at DS Diana Stalder summer kit launch "Fruity SKINsation Set" happen at Gateway Mall, QC. Upon seeing the GREENMAN for the first time is like seeing an aura of positivism, from the way he smiles, the way he dresses and all of us is in ohhh..when he started to speak about ways to be more concern about saving energy, reducing electricity consumption and taking an eco-action for our planet. GREENMAN is so committed to inspire more individuals to at least make that baby steps to help protect the planet. Would you believe he only consumes 10USD (470Php) on electricity bill per month? But he enjoys the luxury, freshest and most relaxing way of leaving. He showed us some sort of a gadgets/things to monitor or combat climate change like, how to limit the time of phone charging, the calculating the energy consumption, buying organic food, clothing and products (like Diana Stalder soap that uses organic materials) and to recycle/upcycle the items instead of throw it on trashbin, like for example the one he showed us, a tetra pack that he made to create a wallet. He is an AVID ENVIRONENTALIST, who hails from Germany. He develop a strong connection with nature from a young age, and has been a passionate advocate of green living ever since. In 2008, he was voted 'Greenest Person on the Planet' in an online competition by 3rd Whale in Canada. He currently live in Malaysia without a car. He started Eco Warriors Malaysia, a community movement focused on taking positive action to combat climate change. He graduated with Masters in Environmental Science from Brunel University in the UK and went on to start a successful environmental consulting company in 1999. In 2007 , he co-founded Maleki GmbH, a German company specializing in high performance, low carbon footprint construction materials. He serve as a Board Member of Solexel Malaysia Sdn Bhd, a wholly-owned subsidiary of Solexel Inc, in Silicon Valley. He is a consummate speaker and trainer on environmental issues, and is often seen giving green talks to corporate institutions, government organizations ans schools in the South East Asian region. 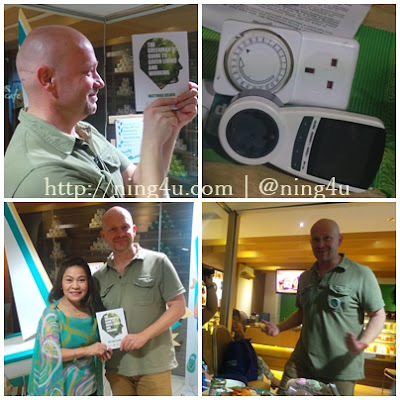 Published his first book titled "The Greenman's Guide To Green Living And Working". Speaking of which, we are all very lucky to have a copy of the book and personally signed by the Greenman himself. I am not halfway through reading it, but I got so inspire to go green, if fact I made a bookmark from a recycled carton :).